Die Fifa hat angekündigt, dass ihre Ethik-Kommission im kommenden März den Schlussrapport zum ISL-Korruptionsfall präsentieren wird. Ich gehe davon aus, dass sämtliche Untersuchungen eingestellt werden. Nachweislich korrupte Sportfunktionäre werden nicht belangt. 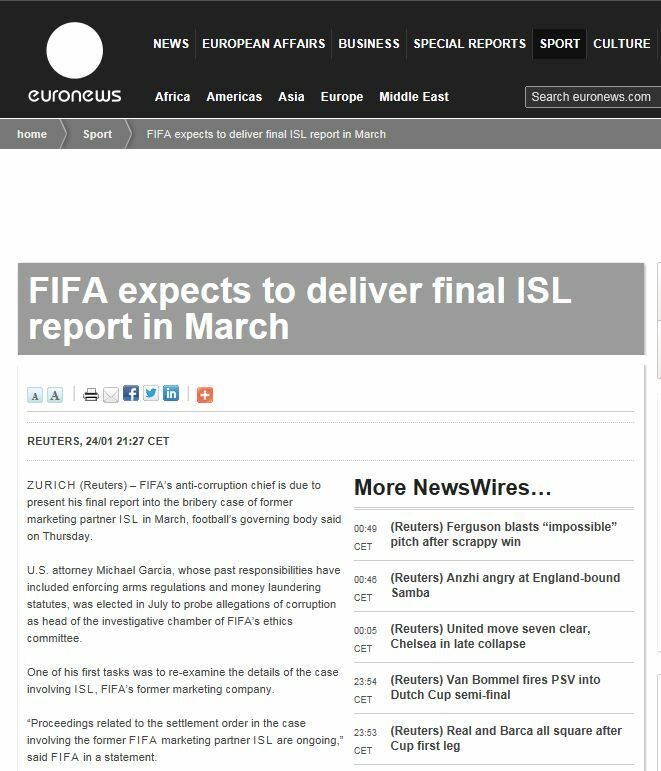 ZURICH (Reuters) – FIFA’s anti-corruption chief is due to present his final report into the bribery case of former marketing partner ISL in March, football’s governing body said on Thursday. U.S. attorney Michael Garcia, whose past responsibilities have included enforcing arms regulations and money laundering statutes, was elected in July to probe allegations of corruption as head of the investigative chamber of FIFA’s ethics committee. 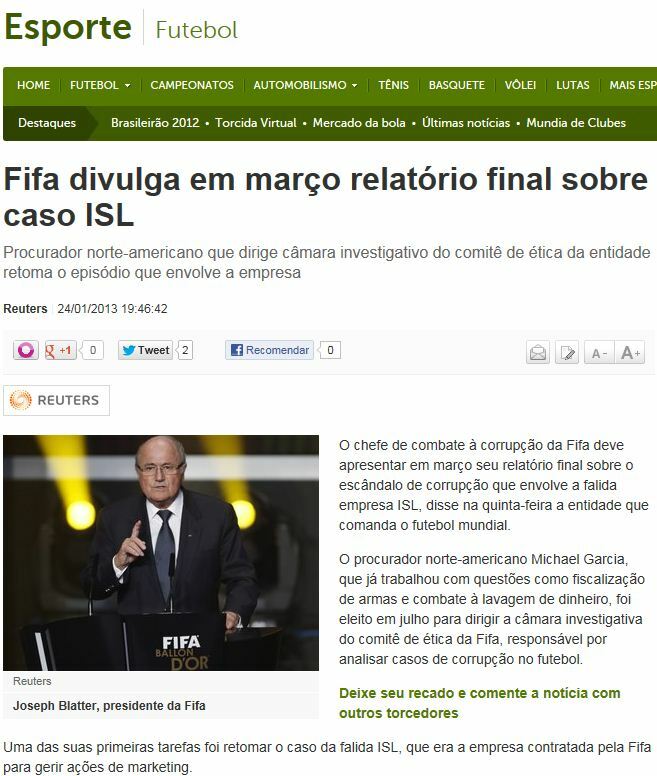 One of his first tasks was to re-examine the details of the case involving ISL, FIFA’s former marketing company. “Proceedings related to the settlement order in the case involving the former FIFA marketing partner ISL are ongoing,” said FIFA in a statement. A Swiss prosecutor said in a legal document released last July that former FIFA President Joao Havelange and former executive committee member Ricardo Teixeira took multi-million bribes on World Cup deals in the 1990s. The bribes were paid by ISL, which collapsed in 2001. Havelange is FIFA’s honorary president while Teixeira quit as head of the Brazilian Football Confederation (CBF) last year. Swiss member of parliament Roland Buechel said at the time that FIFA needed to further investigate the actions of FIFA executive committee members Nicolas Leoz and Issa Hayatou in the ISL case. Hayatou, president of the Confederation of African Football (CAF), was reprimanded by the International Olympic Committee in 2011 after he admitted receiving ISL payments although these were not judged to have constituted a bribe. Leoz, president of the South American Football Confederation, was accused in a BBC Panorama programme of receiving money from ISL. He denies wrongdoing. FIFA reiterated that the ethics committee would review allegations around the bids for the 2018 and 2022 World Cups which were awarded to Russia and Qatar respectively. “As has been publicly announced, certain allegations regarding events surrounding the bidding for the World Cup 2018 and 2022 were referred to the ethics committee by FIFA following media reports,” the statement added.